The term "plastics" covers a very diverse group of materials each with its own different characteristic physical properties and possible uses. We stock a comprehensive range of both standard engineering (semi-finished products) and glazing plastics including PERSPEX® (acrylic) Lexan® and Marlon (polycarbonates) that we can cut to your exact requirements. 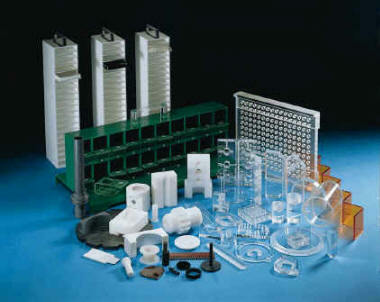 We also stock specific building plastics and associated products. Including corrugated PVC and multi-wall Polycarbonate roofing sheets. 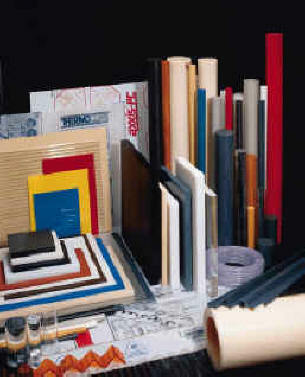 We are appointed stockists for the Kestrel-BCE range of PVC-U fascia, soffit, cladding and window trims. As distributors for Quadrant EPP (UK) Ltd and appointed stockists of the Tufnol range of thermoset products, we are able to supply economic quantities of the more unusual high performance materials. Please note Polypenco Ltd and Erta were merged and became DSM EPP. Subsequently DSM EPP has been sold on and now trades as Quadrant EPP. Semi-finished products such as rod, plate, sheet and tube for subsequent machining offer a cost-effective alternative to expensive moulding and extrusion processes. At our Cambridge factory we have a machine shop providing milling and turning services. As well as a highly specialised fabrication department incorporating bonding, heat forming and welding techniques producing a very diversified range of products to customer's specifications.